Continental's new head-up display includes blue arrows to point the way for the driver. BABENHAUSEN, Germany -- Head-up displays with "augmented reality," the technology that employs much of the windshield as a display area for data and images, is poised to significantly change how drivers see the road. German supplier Continental says it has lined up a production contract to supply its new HUD technology for an unnamed customer in 2017. The company will market its technology as a safety device, said Eelco Spoelder, chief of Continental's instrumentation and driver HMI division. HMI stands for human machine interface. "It allows you to have your eyes constantly on the road," Spoelder said. "If you have to look up from the instrument panel to the road, you need a second to change eye focus. You can travel blindly for quite a few meters." Suppliers use the phrase "augmented reality" to describe large, multicolor head-up displays that superimpose data or images across much of the driver's field of vision through the windshield. Companies such as Nippon Seiki, Harman, Visteon, Bosch, Panasonic, Delphi and others are developing head-up displays, and Denso has said it will market its own version of augmented reality. Continental displayed its technology this month to reporters in a modified Kia K900 on public roads near Babenhausen, a town near Frankfurt where Continental designs and produces head-up displays. For the motorist, the transition from a conventional HUD to augmented reality is like switching from a small, portable black-and-white TV to a big-screen TV. There's a big difference in image size, color and definition, and that allows engineers considerably more freedom to display useful data for the motorist. Continental's new unit is actually two HUDs packaged together. The first is a conventional unit that displays the vehicle's speed, directions for the motorist's next turn and a lane-departure warning. The basic unit's display floats about 2.4 meters (8 feet) in front of the motorist through the bottom of the windshield, a typical HUD position. The second unit produces a virtual display about 7.6 meters (25 feet) in front of the motorist. When the navigation system indicates an upcoming exit, a series of virtual blue arrows floats along the route to be taken. In addition to turn-by-turn information, the second unit displays a more elaborate lane-departure warning, collision alerts and highlights cars on the road ahead that have been detected by the vehicle's intelligent cruise control. During an afternoon test drive on local roads and highways, Continental's prototype HUD produced a clear, intuitive display of turn-by-turn route guidance. Reporters did not have an opportunity to test the prototype in bright sunlight, which can wash out conventional HUDs. A major issue for market acceptance is the bulk of the optics box inside the instrument panel. The prototype optics fit inside a 13-liter container; Continental engineers say they will shrink the production version to 11 liters. "We will drive down the cost and make it a potential mass-market product," Spoelder said. "The question is how much space carmakers will allow [for the optics box]. That will be the decisive factor." A smaller, less expensive "combiner" HUD -- which doesn't require an expensive, custom-designed windshield -- could prove to be the technology of choice for small vehicles. Combiner HUD images appear on a small, clear plastic panel mounted behind the instrument panel. These units can display basic information, but not the big, colorful images of the more expensive unit. The Mazda3 and the Mini, for example, come equipped with combiner HUDs. Spoelder, who has a combiner HUD in his product portfolio, is happy to pitch it as a low-cost alternative. But it's the augmented reality HUD that has the potential to change the auto industry's approach to instrumentation. 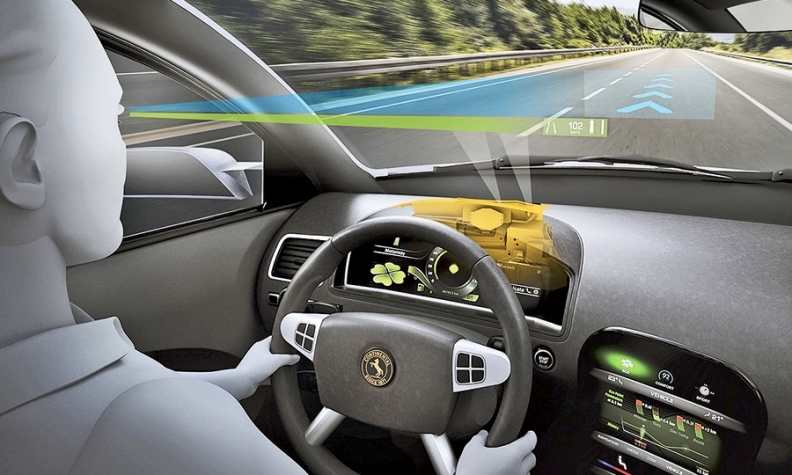 So, which automaker will introduce Continental's new augmented reality HUD in 2017? Spoelder isn't talking, and each of the German luxury brands has used Continental HUDs.